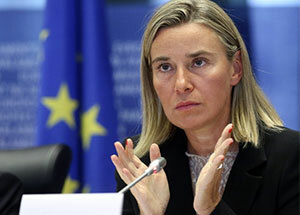 EU foreign policy chief Federica Mogherini arrived in Tehran today on a 24-hour visit to meet with senior Iranian government officials, including President Hassan Rouhani and Foreign Minister Javad Zarif. Moghirini was to discuss the implementation of JCPOA, the nuclear deal, with Iranian officials. Does she wear a scarf in Iran ??? If I was her I wouldn't wear that scarf in Iran.It would be very amusing to watch their faces.What are they going to do? Whip her? And by the way,I have seen some of these Islamic officials wives and daughters in London without any scarf and wearing attire that would qualify in Iran for one hundred lashes and six months in prison.Poor Iranian women are victims of a hypocritical system that is in power. As a foreigner she probably would get away with it. And you at 4:25 PM should be rather concerned about rights of Saudi arabia's women, because this 'website' is concerned more about wellbeing of the Saudi arabia, than Iran when it tries to support the Houthis.